As I emphasize in my book “Write to Influence!” and my workshops, the single and, by the way, most fundamental step in fishing correlates directly to effective communication (written and verbal) — know your audience. How? The likelihood of success increases tremendously with the ability to predict the fish’s behavior. Similarly, you must know your audience. Just like the fish, your audience is smart, discerning, and elusive. I was flummoxed by my mother’s passion – for fishing. However, when I grasped the real allure – the psychology of catch – it made sense. Each time Mom cast her line, she engaged in a battle of wits with the lurking, evasive fish. Think about it. We each function as both fisherman and fish…daily. The fisherman equates to the business owner, author, or an organization marketing a commodity or service. The fish is the consumer. 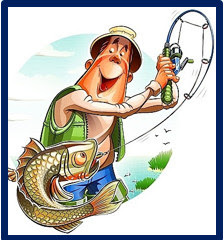 Question: When being interviewed for a job, are you the fisherman or fish? Played correctly, you are the fisherman! Why? You researched the company (e.g., its mission statement, products, and customers). Based on the job description, you know the qualities and experience the company seeks. By contrast, I was recently the fish at O’Hare airport, seeking, ironically enough, a restaurant for breakfast. The first hostess was consumed with her cell phone lying on the podium and without making eye contact mumbled, “Pick any table.” Well, this fish swam to friendlier waters at an adjacent restaurant! Mom would adore this analogy. She was not only an avid fisherwoman, she also authored two books, wrote two long-standing newspaper columns, taught at two universities and a museum, and hosted a radio talk show. That women knew how to hook both the fish and an audience! Know your audience … she nailed that! I thank Aaron, “The Born Again Angler” for his insights on fishing, foundational to this article. You see, I did not share my mother’s passion; when I accompanied her, she fished, and I happily read a book!